Sub:- School Education - Teachers working in Government, Zilla Parishad, Mandal Parishad - Work Adjustment of surplus subject Teachers -To ensure 100% subject teachers in High Schools/UP Schools -Certain Instructions -Issued - Reg. Read:-1) G.O.Ms.No: 29 School Educ:ation (SE.SER.II) Dept, dt: 22.05.2017. 3) G.O.Ms.No.42 SE (Ser.II) Department, Dated: 30.06.2017. 4) Discussions during Video conference held in .tune, 2018. The attention of the Regional Joint Directors of School Education and the District Educational Officers in the State is invited to the references read above and they are informed that there are certain UP/High schools with surplus subject Teachers and some of the Schools are not having at least one subject Teacher to teach the relevant subject. There is a dire need to place surplus subject teachers in the needy UP/High Schools so as to improve learning outcomes. In view of the above, all the District Educational Officers in the State are instructed to identify the Schools without atleast one subject Teacher and UP/High Schools having surplus subject teachers. Further, they are requested to take up the following steps to ensure positioning of at least one subject teachers into the needy High Schools/UP Schools. 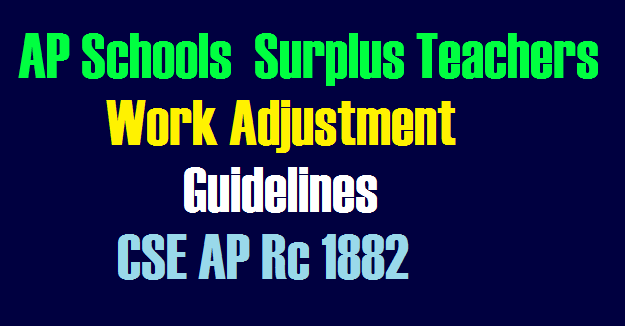 In the first instance surplus subject teachers should be adjusted in the needy High schools. In the second instance, if any of DEO Pool teacher including PETs already working in a particular school where -here is no need as per norms, he/she may be withdrawn and adjusted in needy High Schools. In the third instance, utilize the services of subject teachers working in UP Schools where there is no optimum strength in the classes of VI and VII. They should be deputed on work adjustment in the needy High Schools. In the fourth instance, utilize the services of surplus Secondary Grade Teachers having requisite qualifications in that particular subject for placing on work adjustment in needy High School . All the needy vacancies are to be filled with surplus teachers within the Mandal or neighbouring Mandals or within the division. In exceptional cases, if any of the above possibilities are not available within the division, then subject teachers may be posted out of division in needy High schools. Junior most teacher in the cadre should be deputed on work adjustment. If the Senior is willing to go, he/she has to be given preference. The work adjustment exercise should be completed on or before 30-06-2018 without fail. Therefore, all the District Educational Officers are instructed to adhere to these instructions scrupulously. Further, they are requested to submit the particulars of working adjustment after completion of the process. They shall not give any scope for any kind of delay in the process and any deviation in this aspect will be viewed seriously. All the Regional Joint Directors of School Education are requested to monitor closely the above process with the District Educational Officers under their jurisdiction so that 100% subject Teachers are ensured in High Schools. Compliance report may be submitted by 05.7.2018 without fail.